Cooking the pheasants like this ensures the flesh is very tender and can be pulled off the bones to get as much meat as possible from them. Serve on a bed of couscous with the vegetables that have taken on so many lovely flavours in the pot. Prepare the vegetables, keeping the onions seperate from the rest: Cut the onions in half and then into thin half-moons. Peel the carrots, halve lengthways and then cut into 2” lengths. Trim the celery and cut 2” lengths. Finely chop the stalks of the parsley (keep the leaves). Trim the fennel bulbs and cut into eighths through the root. Preheat the oven to 170C. Season the pheasants. Get the olive oil and butter hot in a large casserole dish on the stove and brown the pheasants all over. Set the pheasants aside and turn down the heat. Put the sliced onions and crushed coriander seeds into the pot. Once the onions have softened add the rest of the prepared vegetables - carrot, celery, parsley stalks and fennel. Season and cook for 5 mins stirring frequently until they have softened too. Add the star anise, bay leaves, unpeeled whole garlic cloves and raisins. After another couple of minutes stir in the fino and 200ml water, turn the heat up and bubble for just a minute. Sit the pheasants on and amongst the vegetables in the pot, cover and put in the oven for 1 hour 20 mins. Remove the pheasants, cover and leave to rest. Strain the vegetables etc out of the pot; remove the star anise and bay leaves, and press the garlic flesh out of the skins. Season and keep warm. Measure out 300ml of broth from the casserole, adding water if necessary. Put the couscous in a dish. Bring the liquid to a boil, pour over the couscous and cover tightly. Leave for 10 mins then fork through the couscous, season and spread over a large serving plate / platter. Spoon the vegetable mix over the couscous. 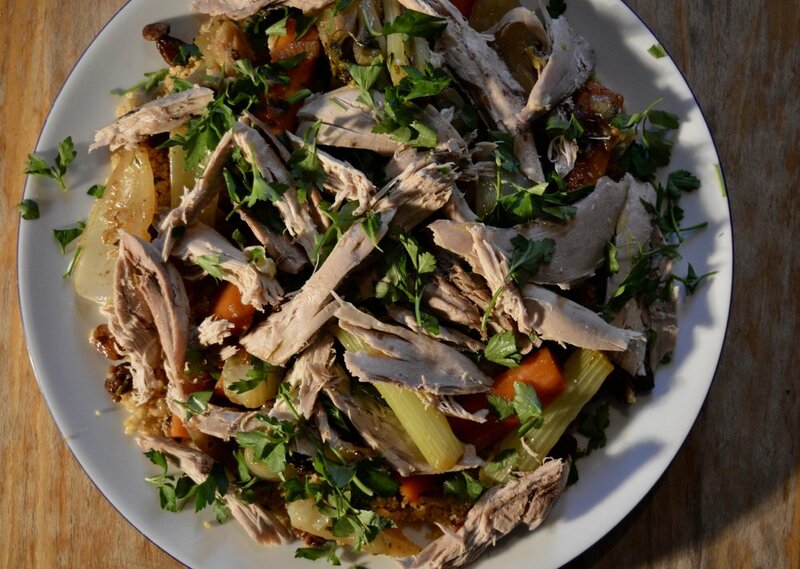 Use a fork or your fingers to pull the pheasant meat off the bones and then scatter the meat pieces over the vegetables. Finish with torn or roughly chopped parsley leaves.